Nine-year-old Emma is lost at sea in a terrible storm. She awakens on a desolate island, frightened and lonely. Yet brave, quick-witted Emma will not be alone for long, as the ghost of a bellboy appears with the tragic tale of the Grand Wenlocke. More than a century ago, a brilliant inventor built a splendid Victorian resort, the Grand Wenlocke. The hotel was powered by a Difference Engine, a miraculous device that could slow down time (making your vacation just as long as you’d like). But just before it was scheduled to open, the Grand Wenlocke mysteriously sank under the sand. Now the storm that brought Emma to the island has awakened the hotel, perfectly preserved and as incredible as ever. While exploring the magical hotel, Emma encounters a kind-hearted cook and her faithful little dog, a seemingly fearsome pirate captain, and the imperious young heir to the Wenlocke fortune (should it ever be recovered). 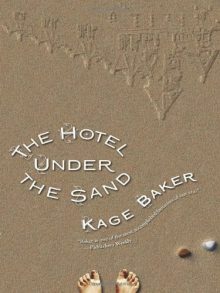 Adventure, friendship, peril, and perhaps even treasure—all these and more await Emma at the hotel under the sand.